This article is about the smartphone made by Samsung. For the tablet made by Nvidia, see Tegra Note 7. Not to be confused with Redmi Note 7 Pro. The Samsung Galaxy Note 7 (marketed as Samsung Galaxy Note7) is a now-discontinued Android phablet smartphone that was produced and marketed by Samsung Electronics. Unveiled on 2 August 2016, it was officially released on 19 August 2016 as a successor to the Galaxy Note 5. It was Samsung's first phone with a symmetrical connector and the last phone in the Galaxy Note Series to have a home button. Although it is the sixth main device in the Galaxy Note series, Samsung branded its series number as "7" instead of "6", so that consumers would not perceive it as being inferior to the flagship Samsung Galaxy S7. The Galaxy Note 7 is an evolution of the Galaxy Note 5 that inherited hardware components and improvements from the Galaxy S7, including the restoration of expandable storage and IP68 water resistance, and new features such as a dual-sided curved display, support for high-dynamic-range (HDR) color, improvements to the bundled stylus and new software features which utilize it, an iris recognition system, and a USB-C port. Demand for the Galaxy Note 7 on-launch was high, breaking pre-order records in South Korea and causing international releases to be delayed in some markets due to supply shortages. The Galaxy Note 7 also received positive reviews from critics, praising the quality of its construction, HDR support, as well as its streamlined user interface, although it was panned for its high price and increasing similarities in overall specifications to the main Galaxy S series phones. On 2 September 2016, Samsung suspended sales of the Galaxy Note 7 and announced an informal recall, after it was found that a manufacturing defect in the phones' batteries had caused some of them to generate excessive heat, resulting in fires. A formal U.S. recall was announced on 15 September 2016. Samsung exchanged the affected phones for a new revision, which utilized batteries sourced from a different supplier. However, after reports emerged of incidents where these replacement phones also caught fire, Samsung recalled the Galaxy Note 7 worldwide on 10 October 2016, and permanently ceased production of the device on 11 October. Due to the recalls, Samsung has issued software updates in some markets that are intended to "eliminate their ability to work as mobile devices", including restricting battery capacity, and blocking their ability to connect to wireless networks. Samsung has stated that it intends to recycle reusable silicon and components from the recalled models, and release refurbished models "where applicable". The recall had a major impact on Samsung's business in the third quarter of 2016, with the company projecting that its operating profits would be down by 33% in comparison to the previous quarter. Credit Suisse analysts estimated that Samsung would lose at least US$17 billion in revenue from the production and recall of the Galaxy Note 7. The Note 7 had the shortest life span of any Samsung phone. In July 2017, 9 months after the Note7 recall, Samsung released a refurbished version of the Galaxy Note 7 called Galaxy Note Fan Edition (marketed as Samsung Galaxy Note FE). It has a smaller battery of 3200 mAh and is supplied with Android Nougat with Samsung Experience UI, the operating system of the Galaxy S8. The successor to the Galaxy Note 7, the Galaxy Note 8, was announced on 23 August 2017 and released almost a month later. The Galaxy Note 7's hardware is similar in overall specifications and design to the Galaxy S7, with a metal and glass chassis, IP68 water resistance, and a microSD card slot. The Note 7 is equipped with an octa-core Exynos 8890 system-on-chip in most markets, and 4 GB of RAM. In China, Japan, and the United States, the Note 7 uses the quad-core Qualcomm Snapdragon 820 instead (which supports older CDMA networks that are extensively used by wireless carriers in these markets), Unlike the S7, which uses Exynos chips in this market, Canadian models of the Note 7 also use the Snapdragon 820. The Note 7 uses a USB Type-C port—marking Samsung's first mobile phone with the symmetrical connector. The Galaxy Note 7 features a 5.7 inches (140 mm) 1440p Super AMOLED display. Similarly to the "Edge" models of the S6 and S7, the display curves over the side bezels of the device; the curvature allows the Note 7 to be 2.2 millimetres (0.087 in) narrower than the Galaxy Note 5. The display supports high-dynamic-range video, and is coated in Gorilla Glass 5. As with all Galaxy Note models, the device is supplied with an active stylus branded as "S Pen". The Note 7 stylus supports 4,096 levels of pressure sensitivity and is water resistant. The Note 7 features the same 12-megapixel rear-facing camera as the S7, with a "Dual Pixel" image sensor and f/1.7 aperture lens. The Galaxy Note 7 also offers an iris recognition system, using a front-facing camera and infrared illumination. The iris scanner can be used for unlocking, and as authentication for other features of the device (such as Samsung Pay and Secure Folder). A fingerprint reader is also embedded in the home button. The Galaxy Note 7 is supplied with Android 6.0 "Marshmallow" and an updated version of Samsung's proprietary TouchWiz user interface and software suite codenamed "Project Grace". It features an "always-on display" mode, which can display a clock and notifications on-screen when the device is not in use; different clock styles and support for notifications from third-party apps were added for the "Grace" version. The Screen off memo feature also leverages this mode, allowing users to write notes on the always-on display. The OS also features several new tools supporting the S Pen stylus, including translation, a screen magnifier, and a GIF recording tool. The previous suite of note-taking apps were also consolidated into a single Samsung Notes app. The Galaxy Note 7 introduces a security feature known as "Secure Folder"; it allows users to create a private workspace, protected by an authentication method, with separate user data and apps that are sandboxed from the main system. Installed apps can be cloned into Secure Folder, and users can designate whether notifications generated by apps in the Secure Folder are displayed from outside it. Secure Folder is based on the Samsung Knox 2.7 technology, which also added the ability for enterprises to control the distribution of system updates, and improvements to mobile device management and Microsoft Exchange Server integration. The device also introduces Samsung Pass, a platform allowing apps to provide biometric authentication using its iris scanner. Samsung reached partnerships with several major U.S. banks to explore the integration of Samsung Pass into their mobile apps. Pre-orders for the Galaxy Note 7 opened the day following its unveiling, with a U.S. release on 19 August 2016. Samsung skipped the numbering of the Galaxy Note series directly from "5" to "7" to synchronize it with the flagship Galaxy S series, and the Galaxy S7 line. The company stated that consumers may have perceived the Galaxy Note models to be inferior in technology to Galaxy S models because the numbering in their names were one digit lower. Pre-orders in South Korea already broke records with 200,000 plus units pre-ordered within 2 days. Samsung Canada stated that pre-orders in Canada were "outstanding". The demand also forced countries like Malaysia, Netherlands, Russia and Ukraine to delay their releases to September due to shortage in supply. TechRadar complimented that the Galaxy Note 7's "rich-looking, glass-and-metal-fused design" would "really wow people who are upgrading from those old, plastic-clad Note 4 and Note 3 handsets", but noted that the curved edges of the screen infrequently caused minor issues when using the stylus. The display was considered to be vibrant and well-suited for multimedia, especially due to its HDR support. Aspects of the software were also praised, including the continued trimming of Samsung's TouchWiz suite and its streamlined settings interface, and that it already included features introduced to the stock operating system as of Android "Nougat" (although still being initially supplied with Android "Marshmallow"). Of the device's new stylus-oriented features, the consolidated S Notes app, GIF recorder, and always-on display functionality were commended, but the translation tool was considered to be inferior to Google Translate. The Galaxy Note 7's battery was judged as being capable of one-and-a-half days of normal use, and it was noted that the software also featured numerous estimation and power-saving features. Techradar concluded that "If you're going to get out of the stylus, the Note 7 is an obvious choice. The iris scanner doesn't make it a convincing enough buy on its own. Otherwise, save your money and stick with the S7 Edge." Ars Technica was critical of the Note 7 due to its many similarities to the Galaxy S7. The Note 7's refreshed design was commended for being smoother and more ergonomic than previous Samsung devices with curved screens, although the company was panned for using glass on the rear panel rather than metal. The S Pen was also criticized for feeling "cheap", describing it as a "hollow plastic tube that would feel more at home in a 100-pack of disposable Bic pens than in an ultra-premium $850 smartphone". The iris scanner's implementation was panned for adding additional steps to the process of unlocking the phone in comparison to the fingerprint reader, and that it does not integrate into Android's integrated authentication platforms (making it proprietary to Samsung components). Warnings regarding looking at the sensor for too long were also considered to be "just a little scary". TouchWiz on the Note 7 was panned for consisting mainly of "'different for the sake of being different' changes that don't add much to the software experience", and make the interface less consistent with third-party software by removing elements of Material design language. In conclusion, Ars Technica doubted whether the Galaxy Note series was even necessary anymore due to its increasing similarities to the main Galaxy S line, and felt that the device was priced too high, citing Chinese vendors capable of undercutting the prices of major brands while still producing phones of similar specifications. Battery defects (and some user error) caused many Note 7 units to overheat and combust or explode. On 10 October 2016, Samsung permanently discontinued the Galaxy Note 7 due to these repeated incidents. In the original run of devices, the battery, produced by Samsung SDI, contained a design flaw that made electrodes on the top-right of the battery susceptible to bending. This weakened separation between positive and negative tabs of the battery, thus resulting in thermal runaway and short circuits. Following an official recall on 12 September 2016, the Galaxy Note 7 was re-versioned using batteries from China-based Contemporary Amperex Technology (CATL or ATL), which also supplies batteries to the iPhone smartphones. Samsung stated on 23 January 2017 that these batteries had suffered from a manufacturing defect in the welding process, which pushed electrodes up and caused damage to the separation between the positive and negative tabs. Some batteries were also missing insulation tape entirely. Samsung reported that these oversights resulted from the vendor's push to ramp up production of batteries for the replacement phones in order to meet demand. Due to the battery defects, the device is considered a hazmat product, and is prohibited from being taken on-board at many airlines and bus stations. On 31 August 2016, it was reported that Samsung was delaying shipments of the Galaxy Note 7 in some regions to perform "additional tests being conducted for product quality"; this came alongside user reports of batteries exploding while charging. On 1 September 2016, South Korea's Yonhap News Agency reported that Samsung was preparing to recall the device worldwide due to these battery issues. On 2 September 2016, Samsung suspended sales of the Galaxy Note 7 and announced an informal recall, after it was found that a manufacturing defect in the phones' batteries had caused some of them to generate excessive heat, resulting in fires and explosions. A formal U.S. recall was announced on 15 September 2016. Samsung exchanged the affected phones for a new revision, which utilized batteries sourced from a different supplier. However, after reports emerged of incidents where these replacement phones also caught fire, Samsung recalled the Galaxy Note 7 worldwide on 10 October 2016, and permanently ceased production of the device on 11 October. Due to the recalls, Samsung has issued software updates in some markets that are intended to "eliminate their ability to work as mobile devices", including restricting battery capacity, and blocking their ability to connect to wireless networks. A company spokesperson stated that it had received 35 reports of battery failure, which "account for less than 0.1 percent of the entire volume sold". Samsung stated that the hazard was limited to a small fraction of phones manufactured, and released a tool on its website on 19 September to identify affected units by their unique IMEI numbers. The U.S. Federal Aviation Administration (FAA) issued an advisory on 8 September 2016, that passengers should not turn on or charge these devices on board aircraft. The European Aviation Safety Agency made a similar statement on 9 September, stating that "passengers are reminded of the need to inform the cabin crew when a device is damaged, hot, produces smoke, is lost, or falls into the seat structure." On 12 September 2016, the Galaxy Note 7 was officially recalled in the U.S. by the Consumer Product Safety Commission, who advised all owners to shut down and cease all usage of the device, and return them in exchange for a replacement. On 13 September 2016, Samsung announced in newspaper advertisements that it would release a software patch to the affected Galaxy Note 7 devices in South Korea, which prevents the device from being charged beyond 60% capacity to reduce the risk of combustion. The Galaxy Note 7 was subsequently re-issued with batteries supplied by the Chinese company Amperex Technology Limited (which also serves as the main battery supplier for the iPhone line). These replacement models, which Samsung purportedly classified as being safe, had a prominent marking on their packaging to distinguish them from the first wave of recalled units, and render all software battery indicators with green icons. Samsung was granted special permission by Google to allow this change, as it would normally violate the requirements of the Android Compatibility Definition Document (which must be met to license Google Mobile Services software and Android trademarks) for all status bar icons to only be rendered in white. Following the announcement of the recall, Verizon Wireless released a software update to Galaxy Note 7 units purchased from the carrier, which displays the aforementioned green icons on safe devices, and an embedded recall notice on affected devices when the device is plugged in. Unlike the South Korean update, it does not include a charging cut-off. Samsung reported that 80% of devices had been replaced in South Korea, and roughly 50% in Europe and North America. Only 10%[not in citation given] of devices in the U.S. were returned, and about 50,000 devices were traded for a different model. However, Samsung stated that 95% of users chose to maintain their loyalty to the company. In October 2016, several incidents occurred in which replacement Galaxy Note 7 phones still suffered from battery failure and combustion. A Galaxy Note 7 owner in Kentucky was hospitalized with acute bronchitis due to smoke inhalation, after his replacement device caught fire in the early morning of 4 October. The owner told a local television station that he had received a text message not meant for him from a Samsung customer service representative, which read "Just now got this. I can try and slow him down if we think it will matter, or we just let him do what he keeps threatening to do and see if he does it". 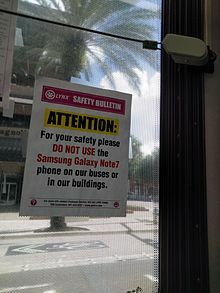 On 5 October 2016, a flight preparing to depart from Louisville was evacuated prior to takeoff when a passenger's replacement Galaxy Note 7, obtained from an AT&T retail outlet, began smoking and popping as they were turning it off. Samsung stated that they were working with Southwest Airlines to investigate the incident, but stated that they would be unable to confirm whether the device was a replacement model until it was recovered. On 7 October 2016, a third replacement phone in Minnesota had reportedly caught fire in a similar manner. A sign at the Air New Zealand check-in counter in Pudong International Airport warning passengers not to bring Note 7 phones onto the plane. In response to these incidents involving replacement phones, the United States' five major wireless carriers (AT&T Mobility and T-Mobile US on 9 October, along with Sprint Corporation, Verizon Wireless, and U.S. Cellular on 10 October) subsequently announced that they would suspend sales of the Galaxy Note 7 until further notice, pending an investigation. On 10 October 2016, Samsung officially announced that it had "[asked] all carrier and retail partners globally to stop sales and exchanges" of the Galaxy Note 7, and urged all owners to power them off and "take advantage of the remedies available, including a refund at their place of purchase". On 11 October 2016, Samsung announced that it would permanently cease production of the Galaxy Note 7 in the interest of customer safety. Samsung began issuing special kits to package the devices for returns; they consist of an antistatic bag that the phone is to be inserted into, and three layers of boxes—the last of which is lined with ceramic fibre paper for fire protection. The shipping box also contains instructions explicitly stating that they are not to be shipped by air. Samsung stated to Vice's Motherboard that it would not repair or refurbish any of the returned phones, and that the company would "safely dispose" of them. Following Samsung's actions, the Rwanda Utilities and Regulatory Authority and the United States' Consumer Product Safety Commission issued official recalls of all units of the Galaxy Note 7. These recalls ban the sale and distribution of any Galaxy Note 7 phone within these countries. The British Royal Mail and British courier company Parcelforce announced that they would not accept or deliver any parcels containing a Galaxy Note 7. Online marketplaces eBay and Gumtree also began to pull listings selling Galaxy Note 7 devices. After the suspension of sales, Oculus VR issued an update to its software for the Samsung Gear VR virtual reality headset, which blocks its use with the Galaxy Note 7 for safety reasons. The headset had been included with some units of the phone as a promotional offer. On 14 October 2016, the U.S. Federal Aviation Administration and the Department of Transportation's Pipeline and Hazardous Materials Safety Administration banned the Note 7 from being taken aboard any airline flight, even if powered off. Qantas, Virgin Australia and Singapore Airlines issued similar bans, while Transport Canada issued a notice stating that the Galaxy Note 7 was banned from flights under Special Provision 137 prohibitions, banning the carriage of damaged or defective lithium-ion batteries onto flights. 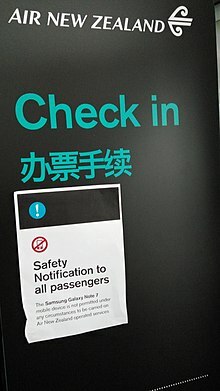 In response to these air travel bans, Samsung announced that it would set up dedicated kiosks at selected airports, to allow travelers to exchange or receive a refund for their Galaxy Note 7 on-site before they depart, rather than having their phone confiscated by security or airport staff. In December 2016, a Virgin America flight from San Francisco to Boston was nearly diverted mid flight after it was discovered that a passenger on the plane had been operating a Wi-Fi hotspot with the SSID "Samsung Galaxy Note7_1097". However, it was later discovered that the hotspot was a hoax, and that no passenger had actually brought a Galaxy Note 7 on board. On 4 November 2016, the New Zealand Telecommunications Forum announced that all Galaxy Note 7 phones would be banned from use on local mobile networks (Vodafone NZ, Spark NZ, 2degrees and around a dozen MVNO's) beginning 18 November, enforced via IMEI blacklist. On 30 November 2016, Samsung announced that Galaxy Note 7 devices would be banned from Australian wireless networks effective 15 December 2016. In December 2016, Samsung announced its intent to cripple the functionality of unreturned Galaxy Note 7 phones in Canada and the United States via software updates. In Canada, an update restricted charge capacity, and blocked the phone from connecting to any wireless networks, or use Wi-Fi or Bluetooth. In the United States, the update blocked the devices from being recharged in order to "eliminate their ability to work as mobile devices". Verizon announced that it would refuse to distribute this update due to the "added risk this could pose to Galaxy Note 7 users that do not have another device to switch to" because it would "make it impossible to contact family, first responders or medical professionals in an emergency situation", especially during the holiday season. On 18 December 2016, Verizon announced that they would be distributing the update on 5 January 2017. Sprint also stated that it would not distribute this update until January 2017. Verizon later announced that it would redirect all outgoing calls (excluding emergency calls) made on unreturned Galaxy Note 7 devices to a service hotline demanding that they be returned, and threatened to charge customers a fee equaling the total retail cost of the phone if they refused to comply. On 9 January 2017, Samsung released another update in South Korea, blocking the device from being charged beyond 15%. On 24 March 2017, Samsung released yet another update for South Korea users, barring charging of the Galaxy Note 7. The Verge criticized Samsung's overall handling of the battery faults and recall, arguing that the company had initially delivered unclear messaging over whether the devices were still safe to use, as well as its slow communication with the U.S. Consumer Product Safety Commission, which had the capacity to issue an official recall in the U.S. The arguments were based on data released on 13 September 2016 by the research firm Apteligent, which stated that Galaxy Note 7 usage had been "almost exactly the same" since the announcement of the exchange program. The Verge also noted that the U.S. government's ban on taking Galaxy Note 7 phones aboard airline flights was "perhaps unprecedented", acknowledging that only the ban of hoverboards by individual airlines for similar reasons—an entire class of products (albeit one that was "admittedly fire-prone because of cheap materials")—came close to a legal ban for a single consumer product in terms of overall magnitude. Kyle Weins of Wired.com felt that Samsung switched to non-removable batteries in order to imitate the industrial design of Apple, after having used removable batteries on many of its past models (such as the Galaxy Note 4). He argued that this design decision exacerbated the battery faults of the Note 7, by requiring users to replace the entire phone as opposed to just the battery. He suggested that in the future, Samsung could "lead the pack" by switching back to removable batteries, as with other "responsible" OEMs such as HP Inc. and LG Electronics. Analysts argued that the recall had hurt Samsung's brand, and would likely cause the company to lose its market share to competitors, including Apple and Google (which had recently unveiled their iPhone 7 and Pixel models), and other Android vendors. Credit Suisse analysts predicted that the recall and discontinuation would cause Samsung to lose nearly US$17 billion in revenue. On 12 October 2016, Samsung revised its earnings forecast for the third quarter of 2016, estimating a 33% drop in operating profits in comparison to the second quarter of 2016, and revenue expectations cut by ₩2 trillion to ₩47 trillion (US$41.8 billion). On 18 October 2016, McCuneWright LLP sued Samsung and filed a proposed class-action lawsuit over its handling of the recall, stating that the company had "failed to reimburse consumers for monthly costs associated with owning an unusable Note 7". Samsung was also criticized by customers affected by the exploding phones, who alleged that the company was refusing to compensate them for property damage caused by the explosions. In the wake of the recall, Samsung, as well as UL LLC, Exponent, and TÜV Rheinland performed internal testing and analysis to determine the exact causes of the defects. Samsung released its official findings on 23 January 2017. Concurrently, the company announced that all of its future battery-operated products would become subject to an "enhanced" eight-point inspection and testing protocol, including stricter visual inspections, as well as charge and discharge tests, Total Volatile Organic Compound tests, and accelerated usage tests. An advisory board of academics was also formed. Concerns were also raised over the creation of electronic waste resulting from Samsung's announced plan to destroy all returned phones, rather than recycle and refurbish them into new products. In February 2017, Korea Economic Daily reported that Samsung had been considering refurbishing the Galaxy Note 7 into a modified version with lower battery capacity, and targeted toward markets such as Vietnam. A representative of Samsung India denied these reports. Greenpeace disrupted a press conference by Samsung at Mobile World Congress to protest the company's unclear plans for the recalled devices. On 27 March 2017, Samsung announced that it now intends to extract reusable parts such as metal, semiconductors, and cameras from the recalled devices, and market refurbished devices "where applicable". In June 2017, the Wall Street Journal reported on Samsung's plan to refurbish its inventory of recalled phones and release them with a new model designation of Galaxy Note FE, with the "FE" referencing "Fan Edition." The phone was also rumored to be named as the Note 7R, with the R referencing "refurbished". This phone was released on the 7th of July in South Korea, with limited availability in other countries to follow, and a price of $610; being a $255 discount from the price of the Note 7. The Fan Edition has a smaller battery of 3200 mAh and multiple safety features. It has a "Fan Edition" logo on the back. The software is identical to that of the S8. It has a similar UI and includes Bixby home and reminders but not the whole Bixby assistant. Samsung introduced an eight-point battery check after the Note7 to make sure all of their batteries are safe for new and current devices in production. There have been no reported incidents of an S8/S8+ catching fire after their release as the first new flagship device to go through the eight-point battery check. There have been no reported incidents of the successor Note 8 catching fire either. After the Fan Edition was released in South Korea, the Galaxy Note FE was also released in select countries in Asia starting in October 2017. ^ "Samsung Galaxy Note7 Teardown". iFixit. 18 August 2016. Retrieved 22 October 2016. ^ "Samsung Galaxy Note Fan Edition Teardown". iFixit. 13 July 2017. Retrieved 18 July 2017. ^ "Samsung Unveils the New Galaxy Note 7. The Intelligent Smartphone That Thinks Big" (PDF) (Press release). Samsung. 2 August 2016. Retrieved 11 October 2016. ^ "Samsung's New Note 7 Borrows The Galaxy S7's Curves And Camera". Fast Company. Retrieved 2 August 2016. ^ a b "Samsung will announce the Galaxy Note 7 on August 2nd". The Verge. Vox Media. Retrieved 28 July 2016. ^ a b c "Samsung recalls Galaxy Note 7 worldwide due to exploding battery fears". The Verge. Vox Media. Retrieved 2 September 2016. ^ a b c d "Samsung formally recalls the Note 7 in the US". The Verge. Retrieved 15 September 2016. ^ a b c d e f g h "Samsung Galaxy Note 7 arrives August 19th with curved display, iris scanner". The Verge. Vox Media. Retrieved 1 September 2016. ^ "What chip will your Galaxy S7 or S7 Edge have?". PC World. Retrieved 21 February 2016. ^ "Samsung Galaxy Note 7 Snapdragon 820 vs Exynos 8890: the beasts clash". PhoneArena. Retrieved 1 September 2016. ^ "Samsung's Galaxy Note 7 runs the Snapdragon 820 in Canada rather than the Exynos 8890 chip". MobileSyrup. Retrieved 1 September 2016. ^ "Samsung's Galaxy Note 7 anoints USB-C as the king of ports". CNET. CBS Interactive. Retrieved 1 September 2016. ^ "Galaxy Note 7 hands-on: Samsung goes full sci-fi with an iris scanner". Ars Technica. Retrieved 1 September 2016. ^ a b "Samsung Galaxy Note 7 review". Techradar. Retrieved 11 October 2016. ^ Gartenberg, Chaim. "Seriously, don't drop your Galaxy Note 7". The Verge. Vox Media. Retrieved 1 September 2016. ^ a b "Samsung Galaxy S7 and S7 Edge: Curvier, faster, micro SD expansion—available March 11". Ars Technica. Retrieved 21 February 2016. ^ "Samsung outs detailed info on its Galaxy Note7 iris scanner". GSMArena. Retrieved 1 September 2016. ^ "Samsung doubles down on security with iris scanner in Galaxy Note 7". The Verge. Vox Media. Retrieved 1 September 2016. ^ "Samsung Galaxy Note 7 review: Sleeker, simpler, better than ever". Engadget. AOL. Retrieved 1 September 2016. ^ "New Note 7 TouchWiz interface features preview". PhoneArena. Retrieved 1 September 2016. ^ "Galaxy Note7 Security Enhanced with Updated Knox 2.7". Samsung Newsroom. Samsung. Retrieved 1 September 2016. ^ "What you need to know about the Note 7's Secure Folder". CNET. CBS Interactive. Retrieved 1 September 2016. ^ "(Update: huge demand in Canada too) Galaxy Note 7 breaks South Korean pre-order record". Android Authority. Retrieved 12 August 2016. ^ SamMobile. "Samsung Canada says Galaxy Note 7 pre-orders are 'outstanding'". SamMobile. Retrieved 12 August 2016. ^ SamMobile. "Galaxy Note 7 delayed in Malaysia because of supply shortage". SamMobile. Retrieved 12 August 2016. ^ SamMobile. "Samsung delays Galaxy Note 7 release in The Netherlands". SamMobile. Retrieved 12 August 2016. ^ SamMobile. "Galaxy Note 7 release delayed in Russia and Ukraine". SamMobile. Retrieved 12 August 2016. ^ "Galaxy Note 7 review: What's the opposite of "bang for your buck?"". Ars Technica. Retrieved 16 October 2016. ^ a b c "Samsung says bad batteries and rushed manufacturing doomed the Galaxy Note 7". The Verge. Vox Media. Retrieved 23 January 2017. ^ a b c "Samsung says two separate battery issues were to blame for all of its Galaxy Note 7 problems". Recode. Vox Media. Retrieved 23 January 2017. ^ a b "Samsung must act fast to keep an exploding phone from blowing up its brand". The Guardian. 10 October 2016. Retrieved 6 November 2016. ^ a b Golson, Jordan (9 October 2016). "AT&T halting Samsung Galaxy Note 7 sales following multiple fires with replacement phones". The Verge. Vox Media. Retrieved 9 October 2016. ^ "Samsung recalls Galaxy Note 7 over battery flaw". CNET. CBS Interactive. Retrieved 11 October 2016. ^ a b c "The Galaxy Note 7 is dead". The Verge. Vox Media. Retrieved 11 October 2016. ^ a b c "Samsung pins explosive Galaxy Note 7 on battery flaw". CNET. Retrieved 13 September 2016. ^ Jansen, Bart (14 October 2016). "Samsung Galaxy Note 7 banned on all U.S. flights due to fire hazard". USA Today. Retrieved 9 March 2019. ^ Epstein, Zach (21 October 2016). "Samsung's exploding Note 7 now banned on planes, trains and automobiles". BGR. Retrieved 9 March 2019. ^ "How to tell if a Samsung Galaxy Note 7 is safe". The Verge. Vox Media. Retrieved 9 October 2016. ^ "FAA Statement on Samsung Galaxy Note 7 Devices". FAA.gov. United States. Archived from the original on 9 September 2016. Retrieved 8 September 2016. ^ "Passenger information on Samsung Galaxy Note 7". European Aviation Safety Agency. Retrieved 9 September 2016. ^ "Samsung software patch for Note 7 caps charge at 60 percent". The Verge. Retrieved 13 September 2016. ^ "Samsung Plans Software Update to Cut Galaxy Note 7 Fire Risk". The Wall Street Journal. Retrieved 15 September 2016. ^ a b Golson, Jordan (9 October 2016). "Samsung knew a third replacement Note 7 caught fire on Tuesday and said nothing". The Verge. Vox Media. Retrieved 9 October 2016. ^ a b Golson, Jordan (8 October 2016). "Another replacement Galaxy Note 7 has reportedly caught fire". The Verge. Vox Media. Retrieved 9 October 2016. ^ "Samsung will mark replacement Note 7 devices with a blue S on the box". The Verge. Retrieved 13 September 2016. ^ "Google's iron grip on Android: Controlling open source by any means necessary". Ars Technica. Retrieved 8 December 2013. ^ "Samsung's latest Note 7 battery fix violates Android compatibility docs". Ars Technica. Retrieved 19 September 2016. ^ "Verizon releases Galaxy Note 7 software update with warning, new battery indicator". ZDNet. CBS Interactive. Retrieved 20 September 2016. ^ "Galaxy Note 7 recall: About 500,000 US buyers exchanged their phones". BGR. Retrieved 24 September 2016. ^ "Samsung: Have 'exploding' Galaxy Note 7s burned the brand?". BBC News. Retrieved 1 October 2016. ^ Bart, Jansen. "Smoking, popping Samsung Galaxy Note 7 prompts Southwest evacuation". USA Today. Retrieved 5 October 2016. ^ Golson, Jordan (9 October 2016). "T-Mobile is second US carrier to halt Galaxy Note 7 sales, giving $25 credit to affected customers". The Verge. Vox Media. Retrieved 10 October 2016. ^ Golson, Jordan (10 October 2016). "Verizon will also stop issuing replacement Galaxy Note 7 phones". The Verge. Vox Media. Retrieved 10 October 2016. ^ "Galaxy Note 7 replacement device sales suspended by U.S. Cellular". SlashGear. Retrieved 10 October 2016. ^ "Verizon, Sprint join AT&T, T-Mobile in pulling Galaxy Note 7". CNET. Retrieved 10 October 2016. ^ "Samsung stops Galaxy Note 7 sales, owners should 'power down'". Engadget. Retrieved 10 October 2016. ^ a b "Samsung permanently stops Galaxy Note 7 production". BBC News. 11 October 2016. ^ "Samsung sending out fireproof return boxes for the Note 7". The Verge. Vox Media. Retrieved 14 October 2016. ^ a b "Samsung will 'dispose of' recalled Note 7 phones, won't repair or refurbish them". The Verge. Vox Media. Retrieved 14 October 2016. ^ a b "Here's what Samsung is doing with all those recalled Galaxy Note 7s". Techradar. Future plc. Retrieved 14 October 2016. ^ Dobie, Ales (13 October 2016). "It's official — two days after Samsung canceled the phone, it's been recalled (again) in the United States". Android Central. Retrieved 13 October 2016. ^ "The CPSC officially recalls all Note 7 devices, citing 23 new reports since first recall". TechCrunch. Retrieved 13 October 2016. ^ Mwai, Collins (13 October 2016). "Rwanda Bans Troublesome Galaxy Note 7". The New Times (Rwanda). Retrieved 13 October 2016. ^ "Samsung Galaxy Note 7 recalled but the Royal Mail is REFUSING to deliver them". United Kingdom: The Sun. 11 October 2016. ^ a b "eBay is removing Samsung Galaxy Note 7 auctions after phone fires". International Business Times. Retrieved 13 October 2016. ^ "Oculus disables Gear VR on Galaxy Note 7 over safety fears". The Verge. Retrieved 11 October 2016. ^ a b "The Galaxy Note 7 will be banned from all US airline flights". The Verge. Retrieved 14 October 2016. ^ "U.S. Department of Transportation bans Galaxy Note 7 from all flights". TechCrunch. Retrieved 14 October 2016. ^ "Samsung Galaxy Note 7: Qantas, Virgin and Singapore Airlines ban phone from flights". ABC News. Australian Broadcasting Corporation. 15 October 2016. Retrieved 15 October 2016. ^ "NOTAM - Samsung Galaxy Note 7". Transport Canada. 14 October 2016. Archived from the original on 18 October 2016. Retrieved 16 October 2016. ^ "Samsung Sets Up Note 7 Exchanges at Major U.S. Airports". Bloomberg. Retrieved 18 October 2016. ^ "Virgin flight delayed by Galaxy Note wi-fi hoax". BBC News. Retrieved 2 January 2017. ^ "A flight was late because someone named their Wi-Fi hotspot 'Galaxy Note 7'". The Verge. Vox Media. Retrieved 2 January 2017. ^ "Explosive Galaxy Note 7 gets blacklisted from New Zealand networks". Ars Technica. Conde Nast. Retrieved 6 November 2016. ^ "Samsung works with Australian carriers to cut Note 7 network access". CNET. CBS Interactive. Retrieved 15 December 2016. ^ "Galaxy Note7 units still in use in Australia will be disconnected from the mobile networks on December 15". GSMArena. Retrieved 15 December 2016. ^ "Samsung is basically making the Note 7 unusable in Canada". The Verge. Vox Media. Retrieved 8 December 2016. ^ "Samsung confirms it will render the US Note 7 useless with next update". The Verge. Retrieved 9 December 2016. ^ "Verizon Wireless agrees to brick Samsung Galaxy Note 7". CNET. Retrieved 18 December 2016. ^ "Verizon refuses to release update that would kill Samsung's Note 7". The Verge. Vox Media. Retrieved 9 December 2016. ^ "Galaxy Note 7 recall refuseniks face new action". BBC News. Retrieved 18 January 2017. ^ "Samsung to limit Note 7 battery charge to 15 pct in S. Korea from Monday". Yonhap News. 4 January 2017. Retrieved 4 January 2017. ^ "Samsung disabling Galaxy Note 7's battery charging in South Korea". CNET. 24 March 2017. Retrieved 24 March 2017. ^ Vincent, James (15 September 2016). "Everyone is still using their Galaxy Note 7 as Samsung fumbles its global recall". The Verge. Vox Media. Retrieved 15 September 2016. ^ "Opinion: Gluing Batteries Down Made It Worse For Samsung". Wired.com. Retrieved 11 October 2016. ^ Cuthbertson, Anthony. "How much money has the Galaxy Note 7 debacle cost Samsung?". Newsweek. Retrieved 11 October 2016. ^ "Samsung slashes profit forecast by a third following Galaxy Note 7 debacle". The Verge. Vox Media. Retrieved 13 October 2016. ^ "Samsung sued over Galaxy Note 7 recall". CNET. Retrieved 18 October 2016. ^ "Samsung owners furious as company resists paying up for Note 7 fire damage". The Guardian. Retrieved 20 October 2016. ^ "[Infographic] Galaxy Note7: What We Discovered". Samsung Newsroom. 23 January 2017. Retrieved 27 June 2017. ^ "This is how Samsung plans to prevent future phones from catching fire". The Verge. Retrieved 23 January 2017. ^ "Samsung Refutes Reports of Plans to Sell Refurbished Galaxy Note 7 Phones in India". Gadgets360. NDTV. Retrieved 22 February 2017. ^ "Samsung confirms the Note 7 is coming back as a refurbished device". The Verge. Retrieved 27 March 2017. ^ "Greenpeace protesters interrupted Samsung's MWC presentation". The Verge. Vox Media. Retrieved 27 March 2017. ^ Amadeo, Ron (28 June 2017). "Samsung's fiery Galaxy Note 7 to rise from the ashes as the "Fandom Edition"". Ars Technica. Retrieved 30 June 2017. ^ Maggio, Edoardo (3 July 2017). "Samsung is bringing back the Galaxy Note 7 with a new 'Fan Edition'". Business Insider. Archived from the original on 3 July 2017. Retrieved 3 July 2017. ^ "Samsung Galaxy Note Fan Edition uses Note 7 hardware and specs, but sports Galaxy S8 UI including Bixby". 2 July 2017. ^ Siddiqui, Aamir (3 July 2017). "Samsung Officially Launches the Galaxy Note 7 Fan Edition in Korea". xda-developers. Archived from the original on 4 July 2017. Retrieved 4 July 2017. ^ Maggio, Edoardo. "A component teardown shows the Samsung Galaxy Note Fan Edition is just a Note 7 with a smaller battery". Business Insider. ^ "Samsung Galaxy Note FE pre-orders begin today in Malaysia". GSMArena.com. 18 October 2017. Retrieved 20 August 2018. Wikimedia Commons has media related to Samsung Galaxy Note 7.